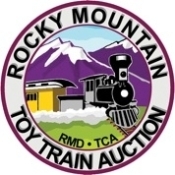 The Rocky Mountain Division is privileged to sell approximately 400 lots of toy trains and accessories,including pre-war, post-war and modern Lionel O, MTH, K-Line, LGB, Ives, American Flyer O and S, Marx, KMT, Hafner, K-Line, Hoge, Weaver, USA, Bachman and Atlas. Highlights include: Lionel chrome Burlington F-3B, 2 NYC ‘785 Hudsons’, TCA Skytop Observation, semi-scale /jewels and Shell single dome tank and B&O 4 bay hopper, and 2-6-4 engine w red firebox. Also, an AF Burlington Zephyr set and O 2-4-2 engine, tender, and two coaches; Marx Western Pacific E7 ABA diesels; LGB Rio Grande Queen Mary Series; and much more! Copyright © 2010-2019 RMD TCA. All rights reserved.